There are various ways we can assist you in your search to find a suitable property whether in Europe or worldwide. International professionals and clients of real estate market meet; it aims to create an opportunity of a quick and efficient search of both new Partners for and direct buyers from different part of the World. 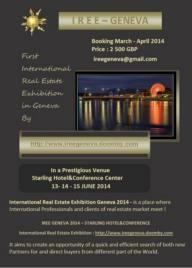 Participation in RealtyGoldWorld International Expo 2014 will be a unique opportunity to hold dozens of meetings with both international Professionals and clients during just a few days. And agents from different countries of the globe will help to enlarge your database of international real estate, and get new opportunities For developing of your business. Please find : condition and advantages of the exhibition. When you sell a property in France, if you are not resident (your revenues are not declared in France) you have to make a capital gains tax declaration. Since January 1st, 2003 a new device concerning the tax representations on the real estate gains of the not residents in France was set up by the French tax authorities. Indeed in application of the article 244 bis A of the general code of the taxes, the individual and moral persons not taken up residence in France are indebted of a taking of 33% on the real estate gains realized in France. Since March 1st, 2004 you are obliged to use an authorised tax intermediary except in the following cases : The sale price of the property is less than or equal 150 000 € by seller or you have owned the property for more than 15 years. Moral persons systematically have to accredit a Tax representative. In case of a claim by the Tax Authorities, the tax intermediary assumes the responsability and the cost of any adjustments or penalties without limitation. If you are foreign seller in France, please contact us, we can introduce you to a famous Tax intermediary, for more than 10 years our partner, as part of its role as a banking institution, has been authorized by the French Tax Authorities as a tax intermediary for both non resident private individuals and limited companies. 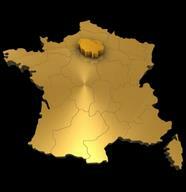 French or foreign: Owners of property in France! French or not you have a property which you handle difficult meetings of condominium and the payment of expenses, invoices and tax breaks. With our support package we can make all the transactions for you and make you free! •The settlement of your property tax. We will send you an annual report!